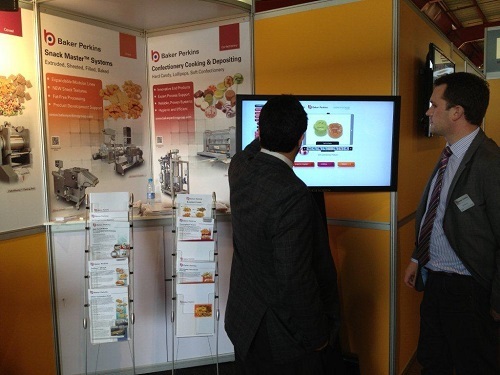 Baker Perkins highlighted its process and product innovation capability for the confectionery, snack, cereal and biscuit industries at Propak Africa in Johannesburg from March 12 to 15, 2013 (Courlanders Agencies stand J12/K7). Production lines supplied by Baker Perkins are at work around the world making thousands of consumer favourites including hard and soft confectionery, lollipops, extruded snacks, biscuits, cookies, crackers and breakfast cereals. Working with customer on new product developments is a particular speciality with extensive lab facilities and the ability to combine technologies from different industry sectors opening up many exciting opportunities. Baker Perkins focused on the potential of the depositing process to make innovative, high-quality hard candy, soft confectionery and lollipops. Depositing systems produce multi-colour, multi-component pieces in one, two, three and four colours; in stripes, layers and random patterns; with one or two hard or soft centre-fills. That applies to hard candy, lollipops, gums and jellies, toffee and caramels and soft candy. With the vast array of confectionery flavours, colours and other ingredients added to the mix there is virtually unlimited product variety available. Depositing technology has the ability to produce confectionery with more visual appeal and better eating characteristics than older processes. Compared with these, deposited candies and lollipops have a glossier surface, a smoother ‘mouth feel’, and more vibrant colours. A wide range of variants is easier to achieve. Operational costs are lower than traditional processes. Set-up is quick and easy using a simple touch-screen interface with recipe-driven change management and, once running, the process requires very little operator intervention. An automatic wash cycle and hygienic design features minimize cleaning and changeover times for greater line efficiency. As well as bal lollipops the latest ServoForm™ lollipop technology has the potential to generate an array of innovative high-quality flat lollipops. For the first time, interesting shapes, such as flowers and hearts, as well as the colours and patterns in the candy, can enhance the visual appeal. Embossing the surface is another new way of increasing the interest and variety of round or shaped lollipops. Another innovation is a high added-value toffee cup, complete with filling and topping or inclusion. These indulgence products require a multi-headed depositor. The first head deposits a toffee cup, the second a filling – fondant, praline, chocolate, jam and jelly are among the possibilities. A third head can add a topping such as chocolate, or inclusions including nut or fruit pieces. Baker Perkins highlighted its ability to provide flexible systems and fresh product ideas for the snack industry. Baker Perkins stressed its process and product innovation capability for the ready-to-eat cereal sector at Propak Africa. Systems for both extruded and traditionally cooked cereals are included in the Cereal Master™ portfolio. Co-extrusion equipment, cereal cookers, flaking rolls, shredding lines, dryers and toasters are available enabling high added-value cereals such as flakes, filled pillows and multigrain products to be made from the same standard extruder. A coating system adding value through frosting or glazing is a further possibility.